I'm alive but playing catchup is always draining. 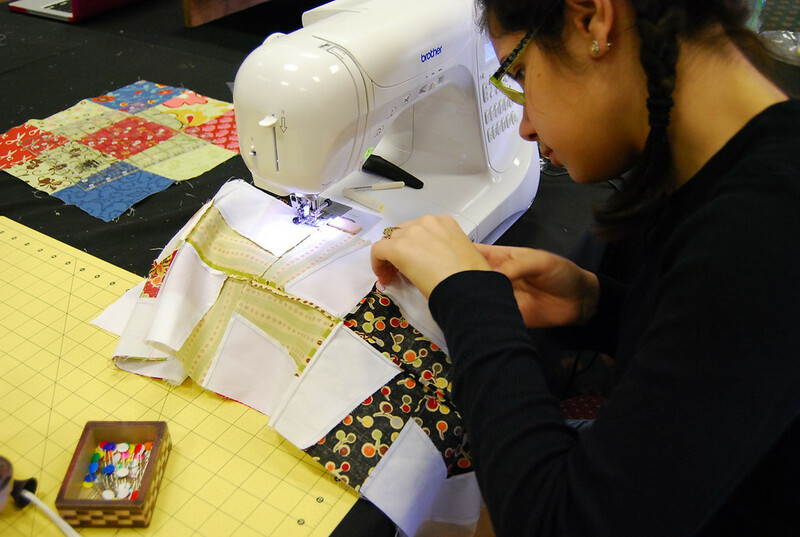 Mid January was my guild's quilting retreat and I convinced my daughter to come with me. We had a great time but when we got back on Monday evening (it was a long weekend for us) we needed to get ready for our work week. I had 2 days of training which meant I was left with two days for real world work. Friday could not get here soon enough! I needed a vacation from my vacation. Isn't that always the case? Well let me share a bit about my retreat. 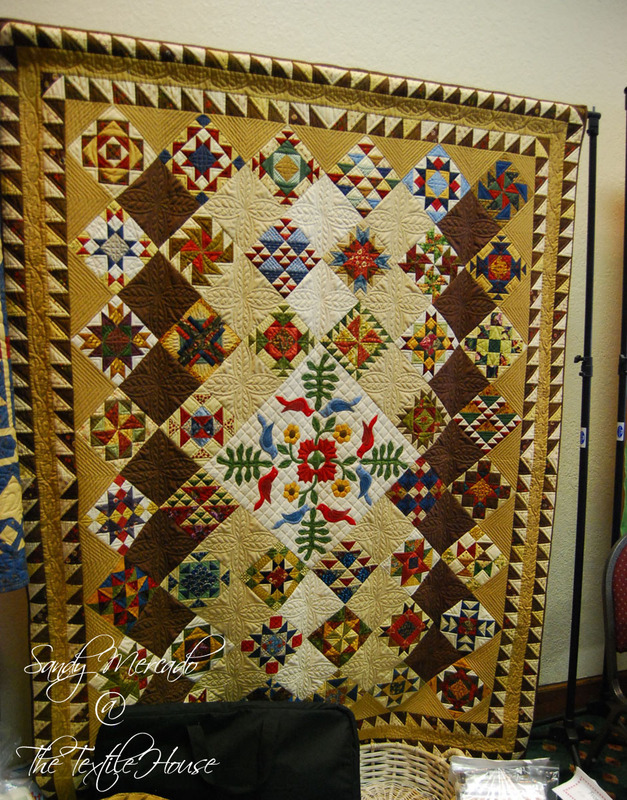 The Dallas Quilt Guild has a great bunch of ladies that get together at Tanglewood Resort every January for 5 days of quilting goodness. Before I left for the retreat I received a little something in the mail that promised to make me the envy of many girls there. Brenda made this for me and I just love it! I was so lucky to get mine before she sold out of the kits she had made up. There were about 80-100 guild members at the retreat. 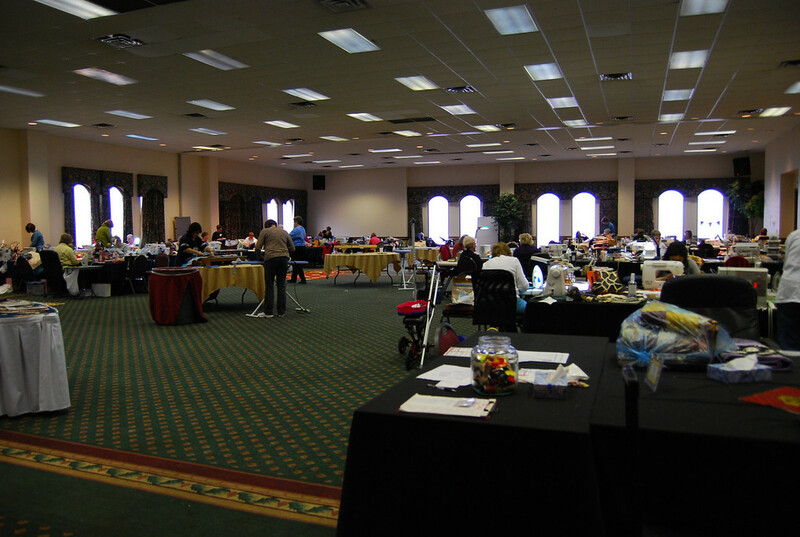 This picture is a glimpse of the ballroom on Sunday Morning. 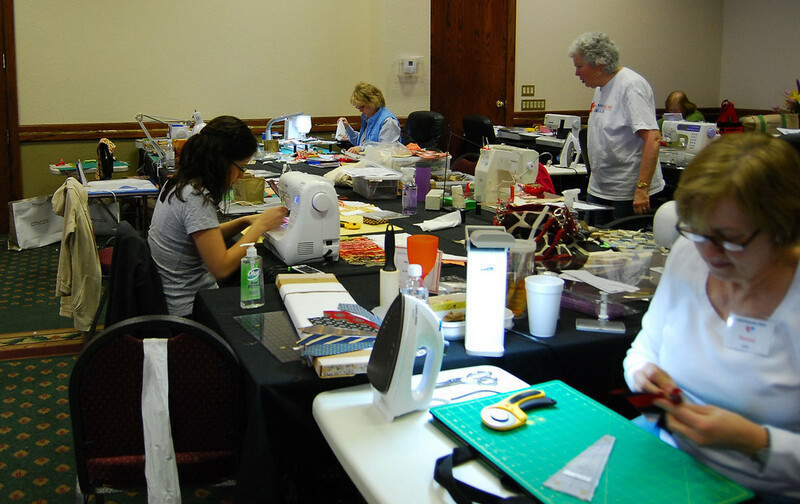 Most of the gals were trickling in after sewing until the wee hours in the morning. 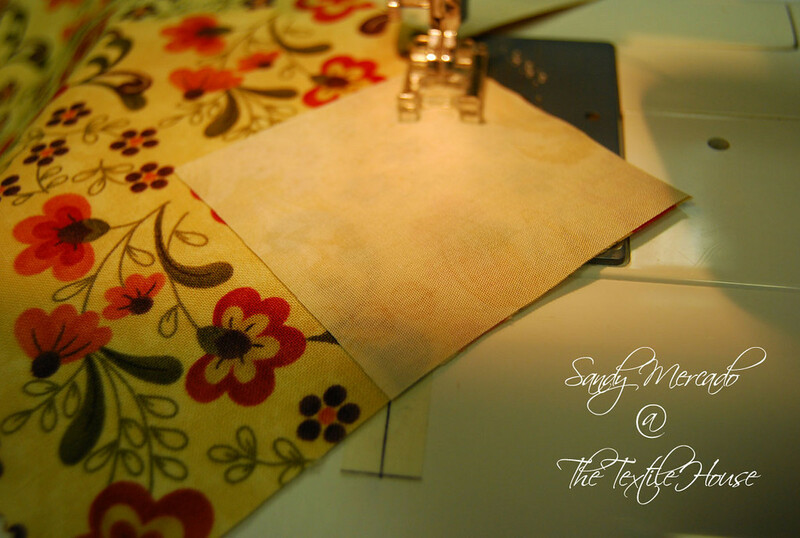 I was there until about 12:30 the night before and when I left there were still about 10 - 20 still sewing and chatting. There are about 7-8 members per table. We were 7 at our table when we arrived on Saturday. The girls were all wonderful and were great company. Lots of chatting and sharing. Everyone was welcoming even when most of us didn't know each other. Most were just so darn impressed that I had brought my daughter (in the grey t-shirt in the pic above). She was not the first young one to attend the retreat. It seems that the granddaughter of our coordinator had been attending the retreat since she was 8 but this year she was on a student exchange in Barcelona. So, Nyshma was the youngest in attendance. Her project (Wild Things by Thimbleblossom's Camille Roskelley) was a great success and found her the center of attention many times. I brought a couple of things to work on. 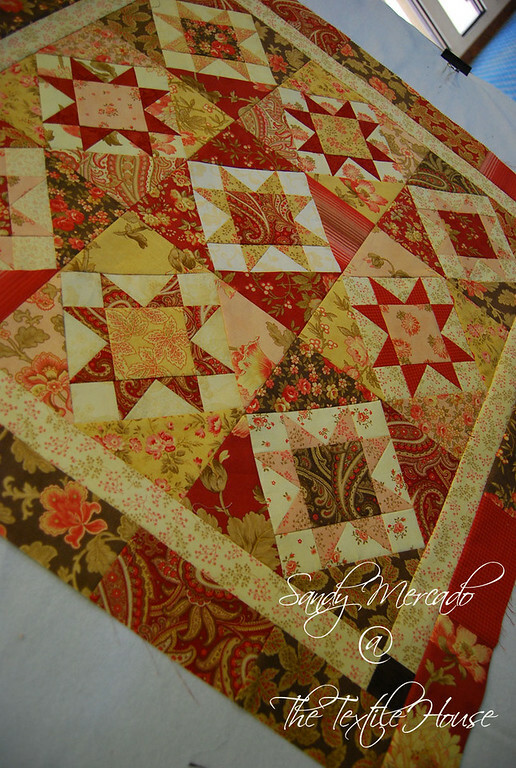 My Schnibbles for January was completed on Saturday and then I started on my Hidden Star project. I found it funny how my fellow guild members bring everything in their sewing room and the kitchen sink to these retreats. Nyshma and I thought we had over done it when we needed one of the hotel rolling carts to bring in our weekend bag and our sewing supplies but there were ladies that brought bins upon bins to the hotel. They needed the rolling cart just for their SEWING supplies! I later figured out why. It seems that they don't want to be caught needing anything and not having it at hand. It seems that my hidden stars pattern needed some squares sewn to the corners of a large rectangle. This would eventually turn into sashing stars. 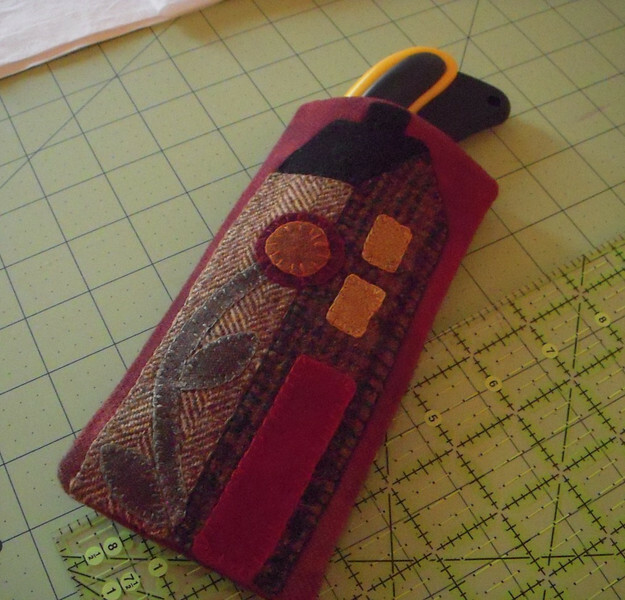 I could have used a neat tool called The Angler 2 by Pam Bono Designs that basically lays down some markings that I can follow to keep the sewing line straight without having to mark each and every square, but I forgot it at home. So I was dreading having to waste time marking those darn squares. Well as I was chatting with Kay (our coordinator) it occurred to me that I only needed the center line to follow and I could get those on my machine with a bit of masking tape (which Kay had). I cut a 1/2" strip of masking tape and marked a line straight through the center. 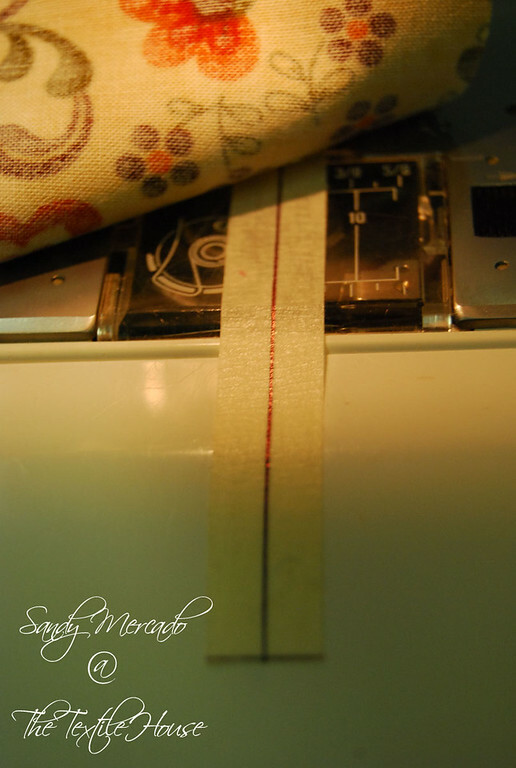 I then found the correct placement using my ruler and taped it on my machine. I then used it as a guide for the corner of the piece. I put the corner of the piece just to the side of the line. 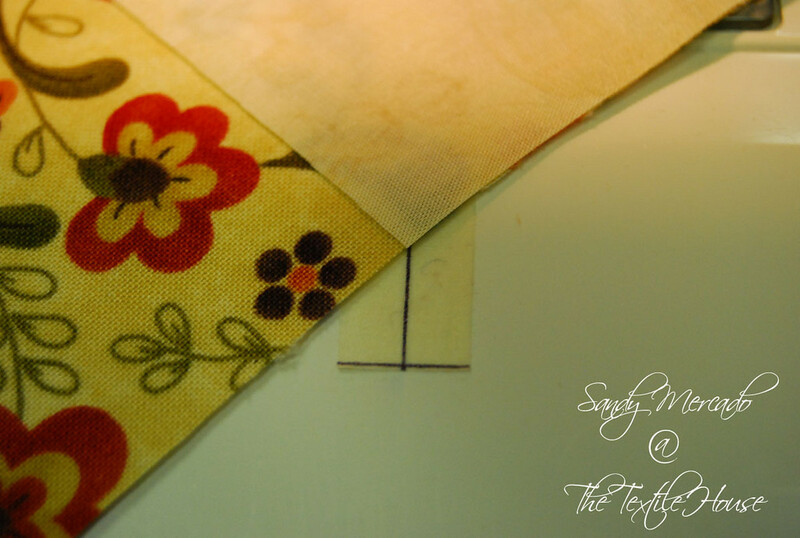 This allowed me to sew a scant 1/4" which would compensate for the few threads that are used when you fold the square back over to the corner and allows the resulting half square triangle to lie exactly where it should. No more tracing lines! I had 40 rectangles. Each rectangle had to have squares attached to each corner. That was 160 squares. It would have been misery to have to trace a diagonal line on all those squares. 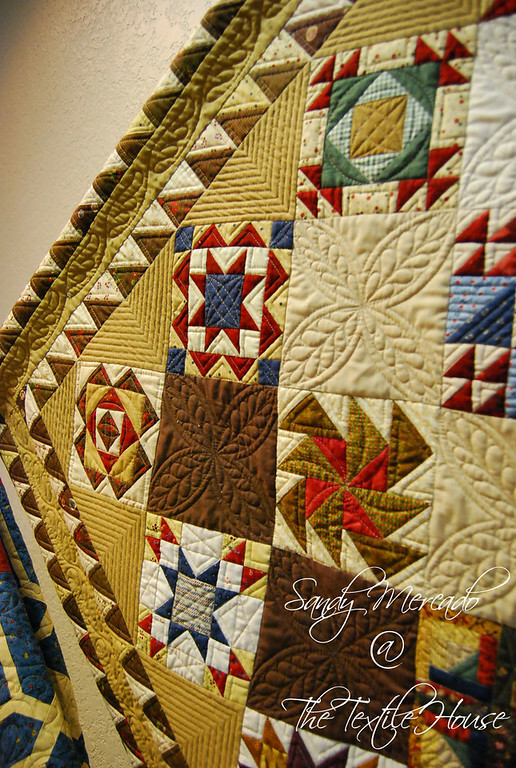 I had to take a few close ups to get a clear look at the quilting because I'm needing this one quilted similarly. This will be my 2010 Challenge. I will be making the blocks as the months roll by. 2 comments on "A Retreat and a Finish"
I;m so glad to read you had such a nice time. Nyshma looks like she was a woman on a mission. Did she finish her quilt? Oh you girls look like you had a great time. Your project turned out wonderful...and I love that little giftie, what a clever idea.